I loved it before and after four months in Japan i love it even more! So when i saw this beautiful seaweed leaves i knew i had to write a post about it. Beautiful leaves for the eye, the soul and to be eaten!!! Great combination!!! 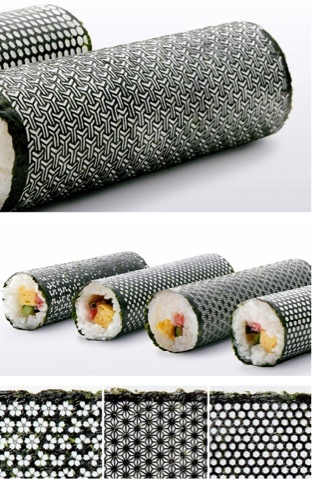 'Design nori' is a series of intricately laser-cut seaweed for rolling sushi. Each sheet of five designs is based on an element of japanese history or symbology, meant to bring beauty, good fortune, growth, happiness, and longevity. Because of the precision required in the cutting process, the seaweed itself is a thicker variety from the sanriku region of miyagi. Umino plans to use the leftover clippings to sell as furikake topping or recompile into other sheets. Developed by creative agency ISBBDO for the Umino seaweed shop the project was commissioned to respark the sale of nori following the tsunami in japan of 2011, at a time when director Hiroyuki Umino noted that japanese were eating less seaweed than in the past. Lendalia, those seaweed wraps are amazing, I've never seen it before, so thanks for introducing me to something new. So happy you visited my blog and you liked the post. I haven't tasted them yet, but they are just beautiful to look at.